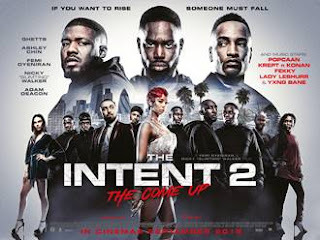 THE INTENT 2: THE COME UP has stood tall this weekend, opening as the #1 film in several of the UK’s biggest Cinemas (Odeon Greenwich, Showcase Newham, Odeon Luxe Birmingham Broadway Plaza, Odeon Surrey Quays and Showcase Walsall), following its release in cinemas on Friday 21st September. The gripping crime thriller, written by and starring young British talent Nicky Slimting Walker and Femi Oyeniran (Kidulthood, Adulthood) who also helmed underground 2016 hit THE INTENT, took home a total of over £149,000 over the weekend. The film starring grime artist Ghetts, had the second highest screen average of all new films opening over the weekend. It performed particularly well in London with 14 of the top 25 sites in the London area, with other key cinemas from West Midlands and in key cites; Birmingham, Leeds, Nottingham and Sheffield. Due to the excellent performance The Intent 2: The Come Up will be responding to demand by opening wider this coming weekend. Starring Nicky Slimting Walker, Femi Oyeniran, Adam Deacon, Ashley Chin, Sharon Duncan-Brewster, Dylan Duffus, Ghetts, Krept & Konan, Fekky and Popcaan. Includes BET nominee Ghetts, MOBO and BET winners Krept & Konan, rap star Fekky, dancehall artist Popcaan, BAFTA winner Adam Deacon (Kidulthood, Anuvahood), Ashley Chin (Starred Up, Anuvahood), Sharon Duncan-Brewster (Bad Girls, Top Boy) and Dylan Duffus (Line of Duty, The Intent). THE INTENT 2: THE COME UP takes the crew to Jamaica and centres on Jay (Ghetts) who has big dreams; but his ambitions are crippled by his allegiance to both his crew and Hackney crime boss Beverley (Sharon Duncan-Brewster). Jay sets about laying the foundations for his own organised crime ring with the help of Mustafa (Adam Deacon). Things are going well until Beverley discovers his disloyalty, and an ill-fated robbery in North London and a trip to Jamaica tears the crew apart. All the while, their actions are being monitored by an undercover Met Police officer Gunz (Dylan Duffus), who has been deployed to integrate himself into the crew.